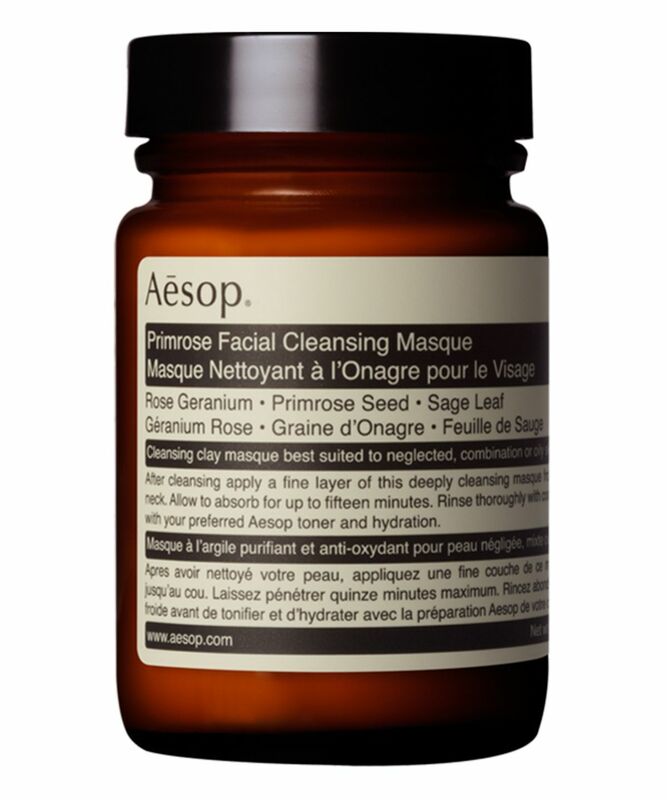 Aesop’s Primrose Facial Cleansing Masque is a clarifying, clay formulation that helps decongest and rejuvenate sluggish skin, without compromising hydration – perfect for dulled or neglected complexions, or oilier skin types in need of a ‘re-set’. With a delicate, fresh green floral scent and ultra-fine clay texture, this gently (but effectively) purges blocked pores of impurities, while skin nourishing vitamin E locks in precious moisture and protects against free radical attack. Used twice-weekly (or whenever your skin needs a radiance boost), this silken masque is best applied to skin straight after cleansing – left for fifteen minutes to work its skin brightening magic – then rinsed with lukewarm water and a muslin cloth, to polish and get your face glowing. 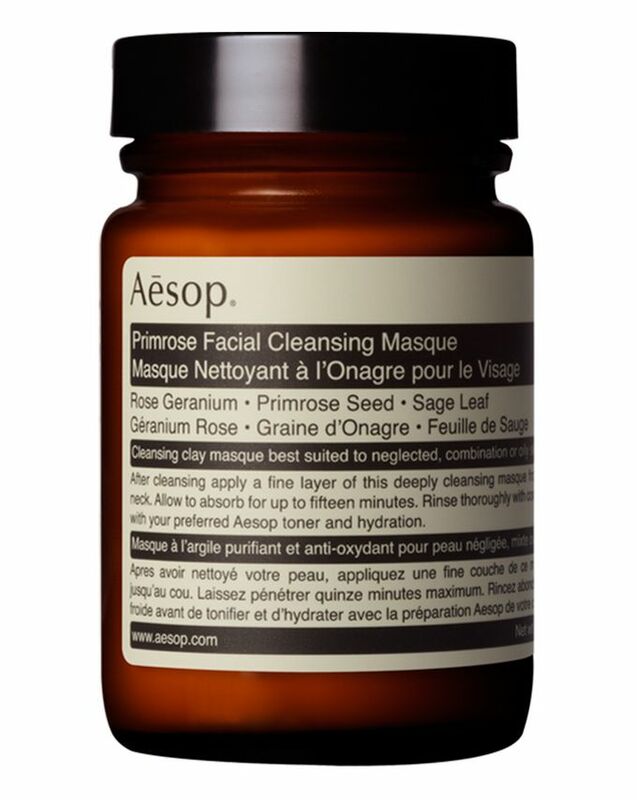 Starring skin-conditioning evening primrose oil – a rich source of skin essential fatty acids – Aesop’s Primrose Facial Cleansing Masque is one of the brands most gentle, making it ideal for all skin types, especially those prone to dehydration (remember even oily skin gets thirsty)! A gorgeous all-rounder, this clay-based treatment helps to clarify, calm and refine – think of it as a weekly sk-investment; to keep your complexion contented. Both beautiful and practical, Aesop’s ethos is all about marrying old world wisdom with new tech disciplines – harnessing the finest botanical extracts and fusing them with the latest and greatest discoveries – to re-train your skin to be the best that it can be. The bottles are made of traditional amber glass (or sustainable plastic), protect against UV degradation and prolong the integrity of their specialist blends (whilst minimising the need for preservatives). Twice-weekly, apply a thin layer of Primrose Facial Cleansing Masque to the face after cleansing. Leave for up to fifteen minutes, then rinse off with warm water; always follow with your preferred Aesop toner and hydrator. Water (Aqua), Kaolin, Bentonite, Alcohol Denat., Glycerin, Pelargonium Graveolens Extract, Oenothera Biennis (Evening Primrose) Oil, Rosa Canina Fruit Oil, Salvia Officinalis (Sage) Oil, Methylchloroisothiazolinone, Methylisothiazolinone, Citronellol, Geraniol, Linalool. This ingredient list is subject to change, customers should refer to the product packaging for the most up-to-date ingredient list. This is one of those products that you can feel is working within minutes of applying. It has a cool and clay-like feel to it, and the smell is fresh & clean (and pretty amazing) - but is not overpowering or overly fragranced. This is one of those masques that gets to work very quickly - don't plan on being able to speak to anyone while it is on - it sets hard! It is easy to wash off after 10-15 minutes and my skin feels refreshed, clean and smooth. I LOVE this product - it's the sort of thing you need in your life to help with that mid-week slump!